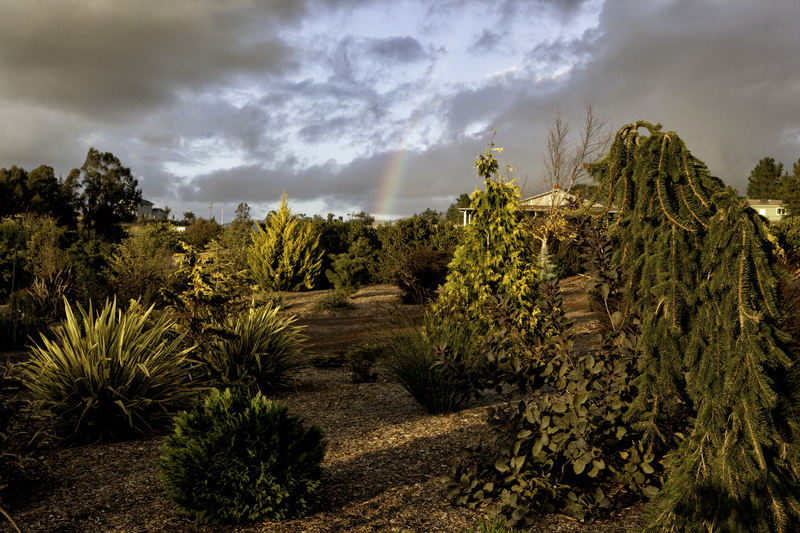 Colors pop in the low light and overcast skies of winter days. We love the soft light of winter and how it shows almost everything to advantage. In the shot above, conifers, yucca and the lingering leaves of a mix of deciduous trees illuminate the landscape. It put us in a party mood, so we thought we’d check out what’s being worn this season. Juniperus cedrus foliage has a distinctly two-toned tweedy look. Hydrangea quercifolia (oak leaf hydrangea) in winter. Is nature imitating art or is art imitating nature? What accessorizes the garden’s tweeds and damasks? A winning strategy is to seek contrasts of color, form and texture. A shiny patent leather would work well with the soft, light-absorbing fabrics. While we’re enjoying the finery, we thought we’d do our hair. Banksia spinulosa ‘Schnapper Point’, or koala blooms banksia, has candle-like (or curler-like!) blossoms that stick out through the foliage. This year it was extremely floriferous so we can cover ourselves in curls. Banksia spinulosa ‘Schnapper Point’. Loofahs? Curlers? We’re going for a pre-Raphaelite look. So what about jewels? We found that Ilex x attenuata ‘Longwood Gold’ has lovely orange beadlike berries. This natural hybrid of two native North American hollies is rarely seen in cultivation and we don’t know why. It makes a perfect pairing with orange libertia. 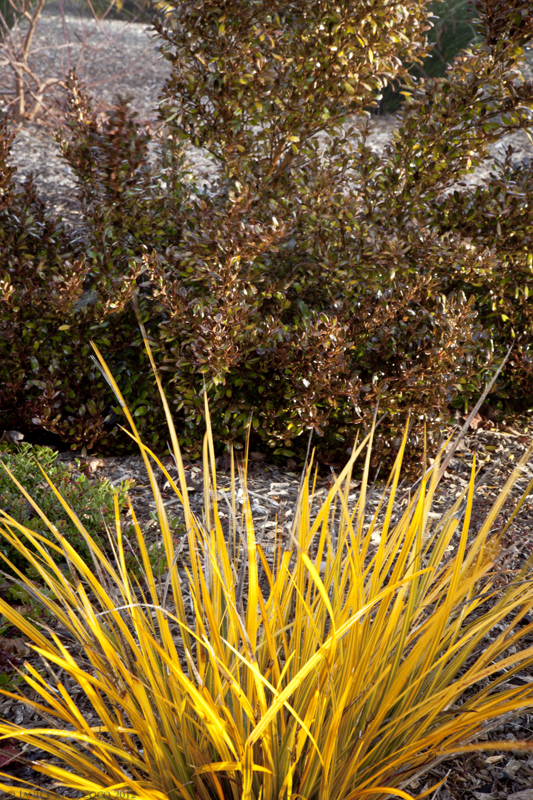 Perfect pair: Ilex ‘Longwood Gold’ and Libertia peregrinans. Now that we’re all dressed, a bit of cosmetic enhancement is in order. Lipstick, nail polish and blush, in the wintery shade of brilliant red. Leucadendron ‘Jester’ wears scarlet-tipped fingers. No gardener has hands like this, however. And now, the finishing touch. We’re completing our outfit with a fan. We just have to choose which one. This Brahea armata is simply loaded with them. Mexican blue palm (Brahea armata) is loaded with fan-shaped fronds. Now there is nothing left to do but to wait for Prince Charming. It may be a long wait. The coach is simply not materializing. 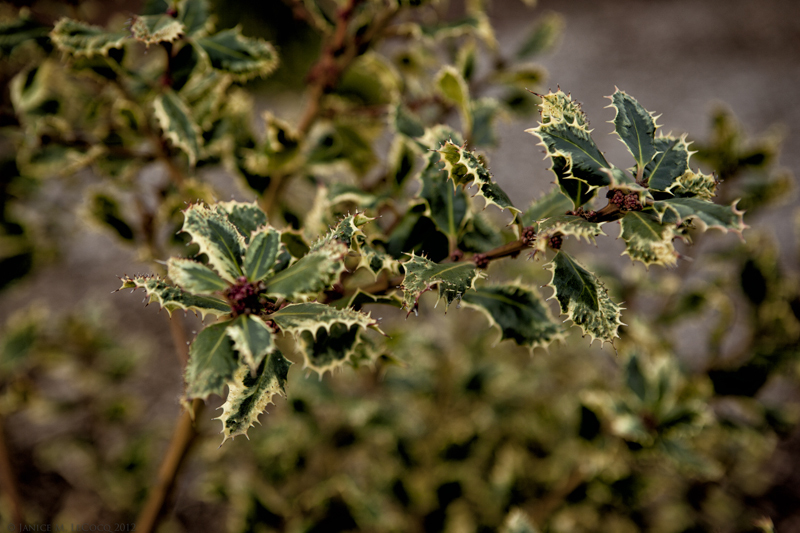 What kind of finery do you have in your winter garden? Categories: Berries, Winter | Permalink. The subject of the winter garden has attracted numerous writers, including such luminaries as Rosemary Verey and Val Bourne. 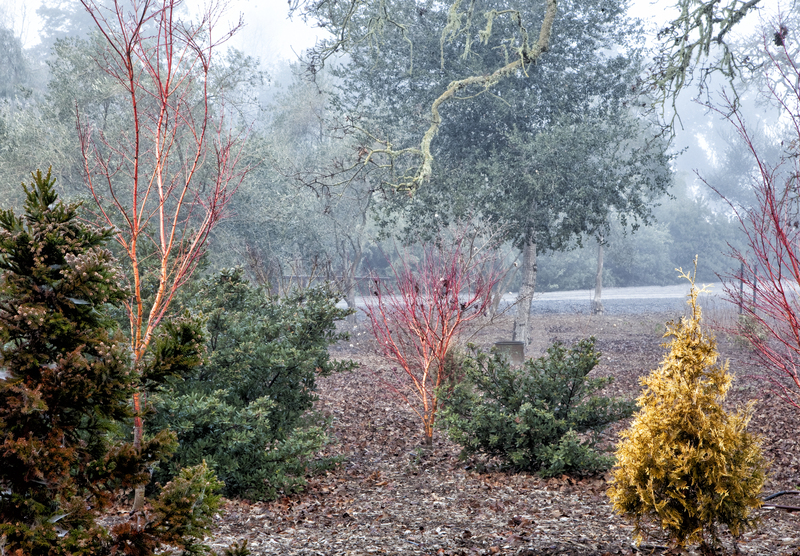 While their books abound with beautiful photographs of snow-laden boughs and ice-encased berries, they tend not to get at the heart of the winter garden’s real bugaboo: drabness. Fresh snowfalls are lovely sights, with the world encased in forgiving white. And it is a rare gardener, indeed, who secretly doesn’t appreciate the fairytale magnificence of a good ice storm, even while bemoaning the damage done to trees and woody shrubs. For sheer beauty, ice is hard to beat. Admittedly, gardening in Northern California does not subject me to the degree of grayness that other parts of the country endure in winter, but I did my time in New Jersey and, far worse, Poughkeepsie, NY. Jan grew up in the Pacific Northwest, which is famous for its cloudy days, which can sometimes drag into weeks. So for all that berries, bark, dried seed heads and the like add interest to the winter garden, what trumps all of them? Gold! 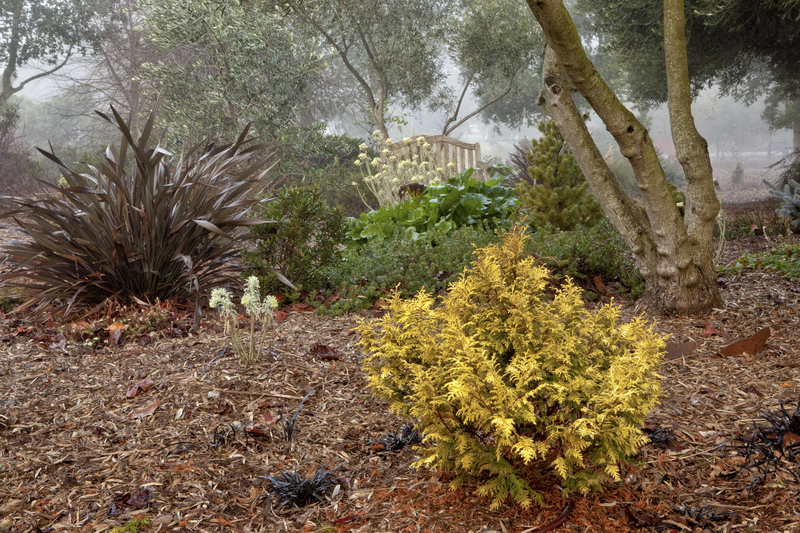 Make sure that your garden has at least one golden evergreen shrub or tree to provide sunshine on dreary days. 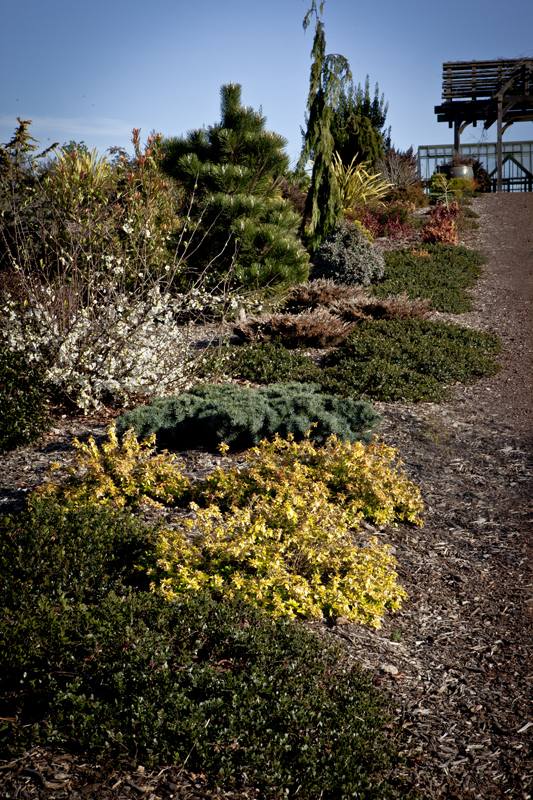 Most golden evergreens are conifers, and there is a seemingly endless array of choices. Those that follow are selections that we have grown and know well; there are many, many others, so use these as suggestions and explore the available offerings in your area. We have tried to include a little something for everyone: large and small, upright and weeping, bold and demure. 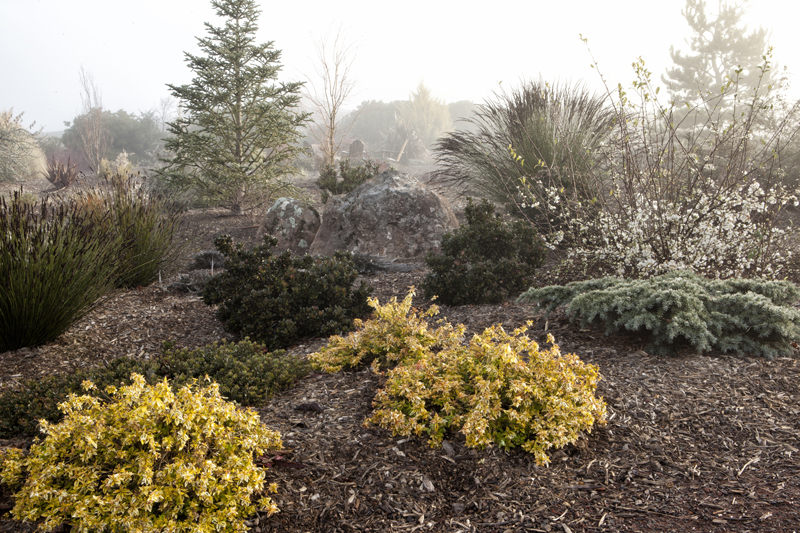 Many of our choices will grow in zones with much colder winters than our Zone 9b. 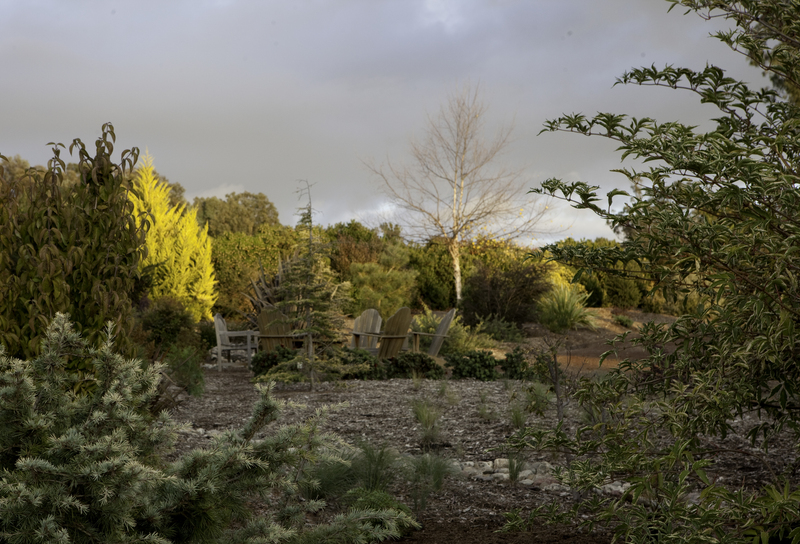 The most brilliant winter beacon in the garden is the citriodora Monterey cypress (Cupressus macrocarpa ‘Citriodora’, at least for now – it’s in the process of being reclassified), which has not only dramatic color but also strongly lemon-scented foliage. 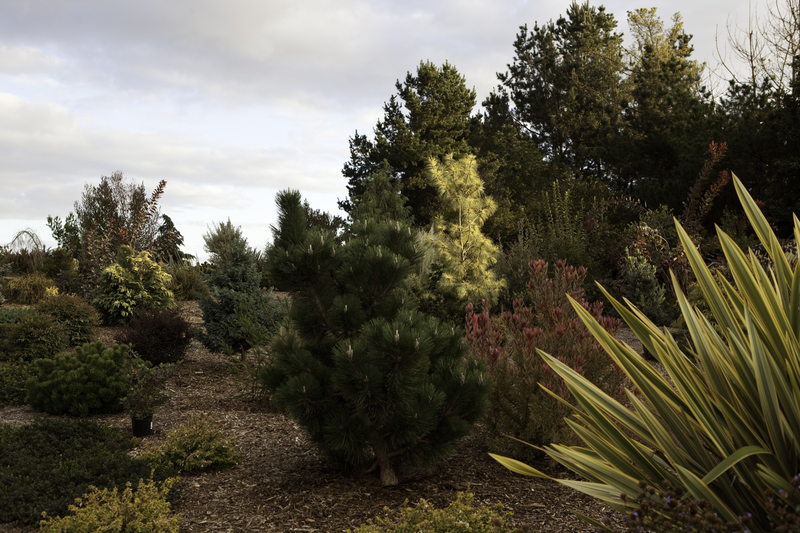 ‘Citriodora’ gets quite large, however – up to 30’ tall – and is a rapid grower by conifer standards. So, it may not be suitable for every garden. It can tolerate winter temperatures down to about 15°F and in hotter areas does better with a bit of shade in summer. 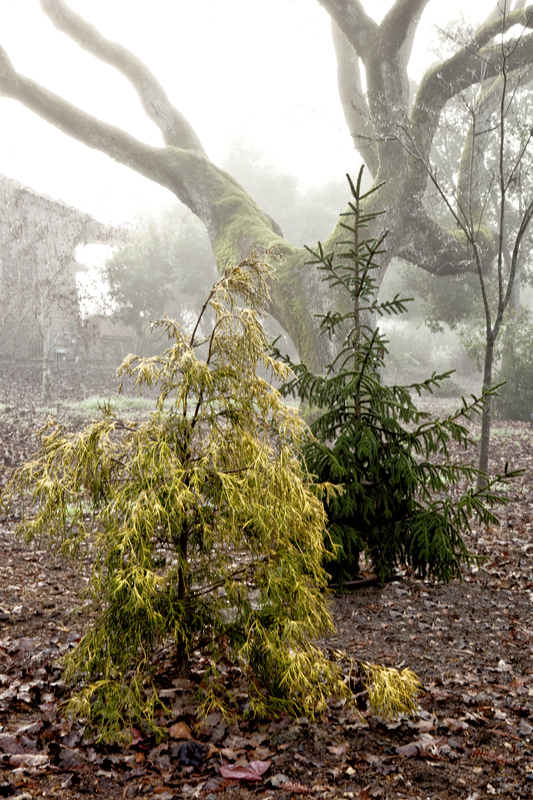 If you prefer a weeping habit, nothing is as graceful as the golden weeping Monterey cypress (Cupressus macrocarpa ‘Saligna Aurea’). 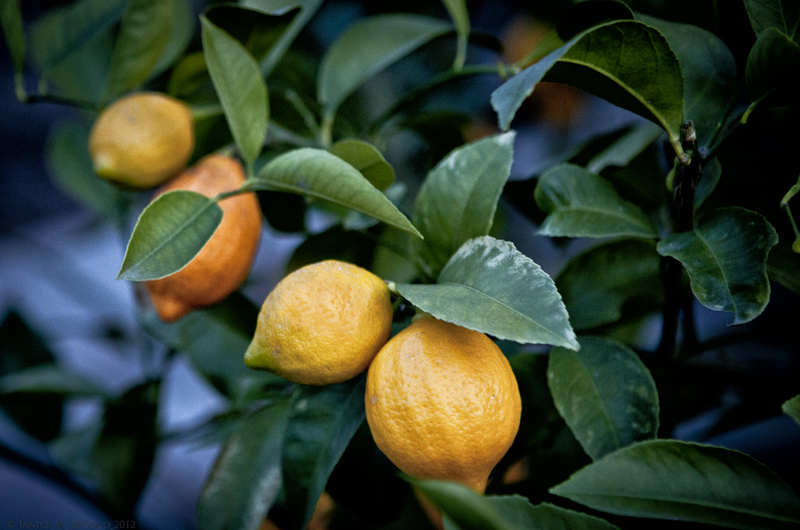 ‘Saligna Aurea’ is another lemon-scented specimen, with delicate, cascading thread-like foliage. You can stake it to the desired height and then allow it to weep at will. 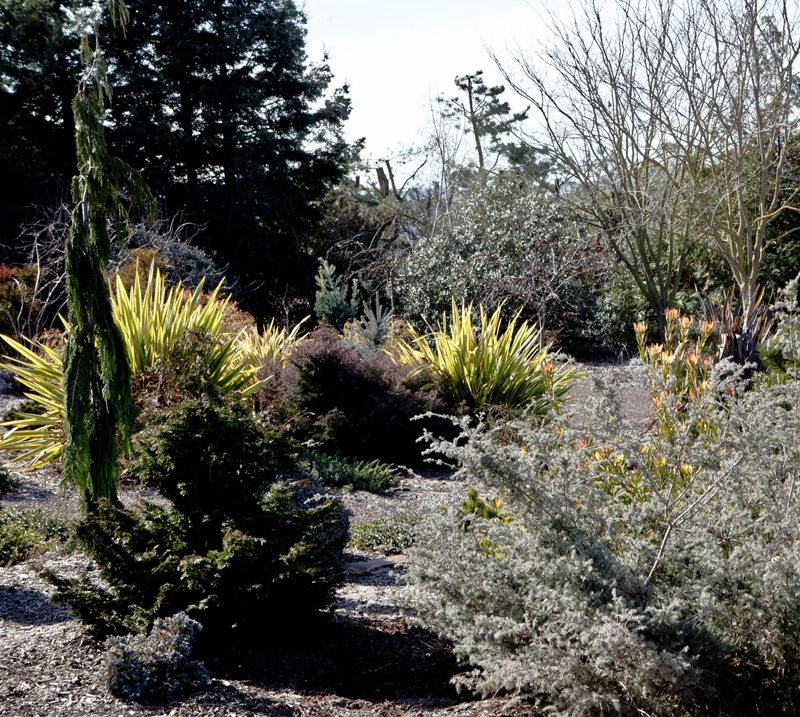 ‘Saligna Aurea’ is a stunning specimen planting and can handle center stage with practically no supporting cast. However it also works well when surrounded by complimentary foliage colors. It is hardy to zero°F and can tolerate full sun if it gets enough water, otherwise give it a little afternoon shade. Another breathtaking golden specimen, that takes on an orangey cast in winter, is the sunshine Western red cedar (Thuja plicata ‘Sunshine’). 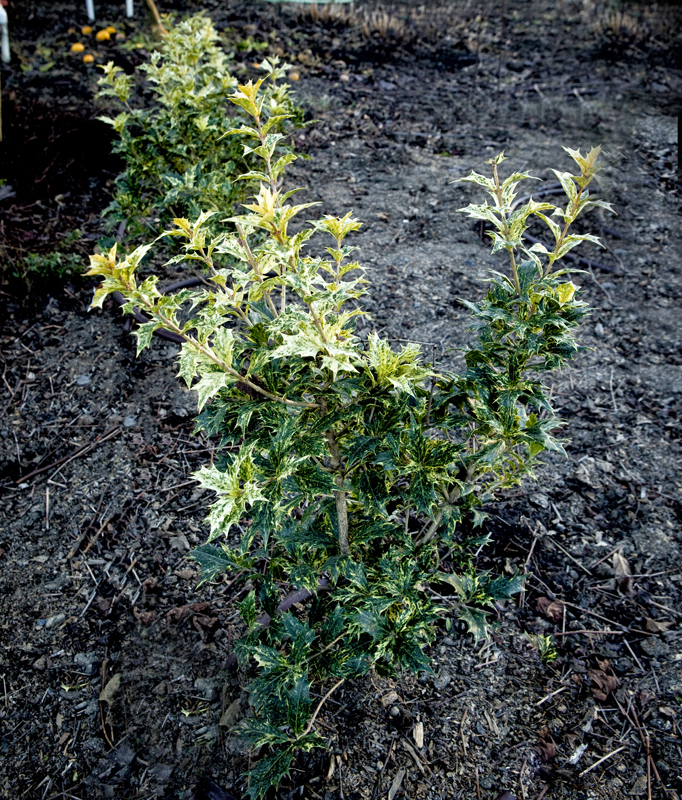 ‘Sunshine’ tolerates colder temperatures (zone 5), and does not burn in full sun. 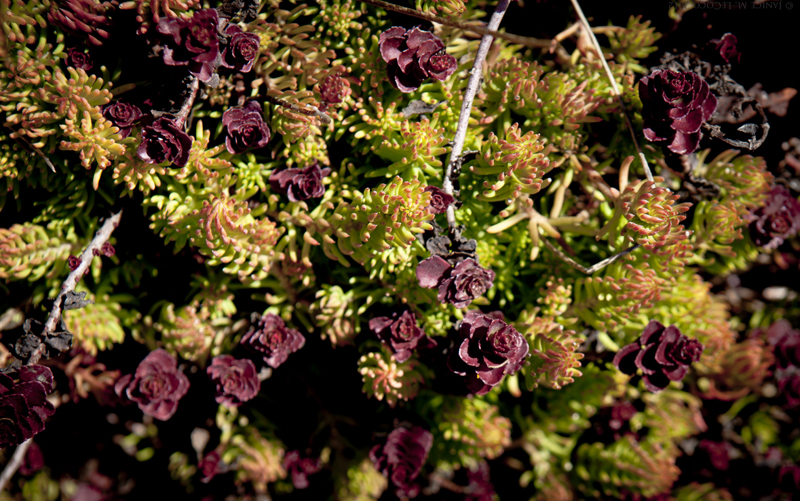 It lights up the garden on cloudy days and when caught by the weak winter sun appears to spontaneously combust. 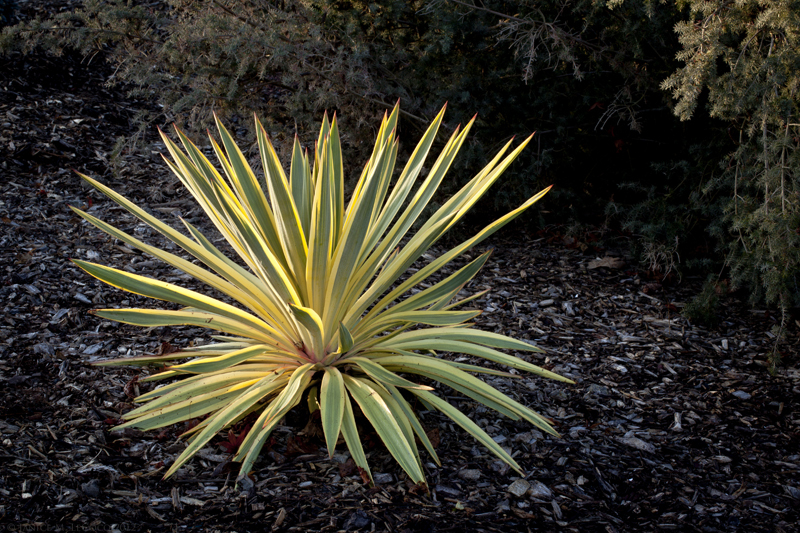 ‘Sunshine’ is another large specimen, ultimately even larger than ‘Citriodora’, but slower growing. 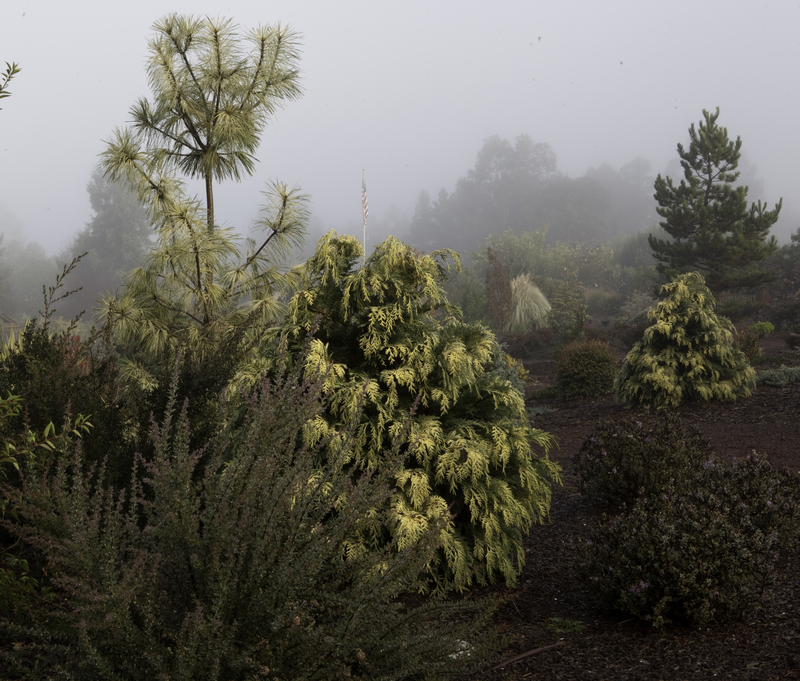 Another glorious yellow tree is Pinus wallichiana ‘Zebrina’. 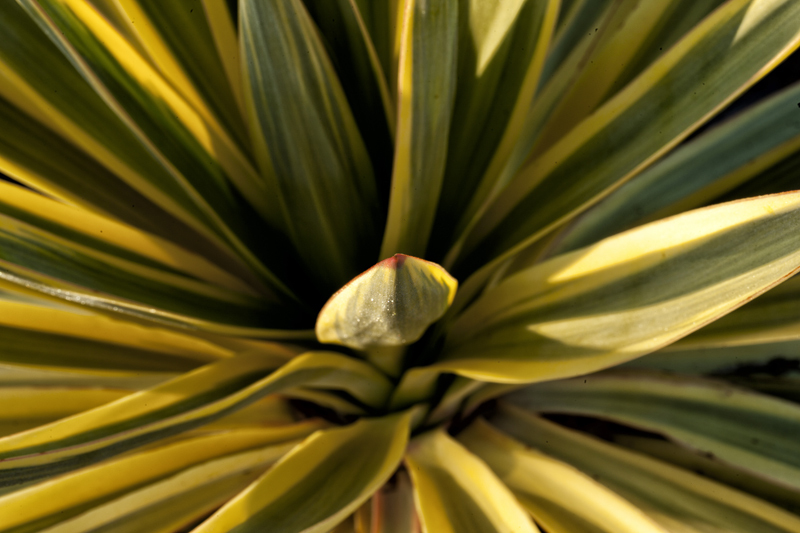 ‘Zebrina’ has long, drooping needles in groups of five, striped green and yellow for dramatic effect. 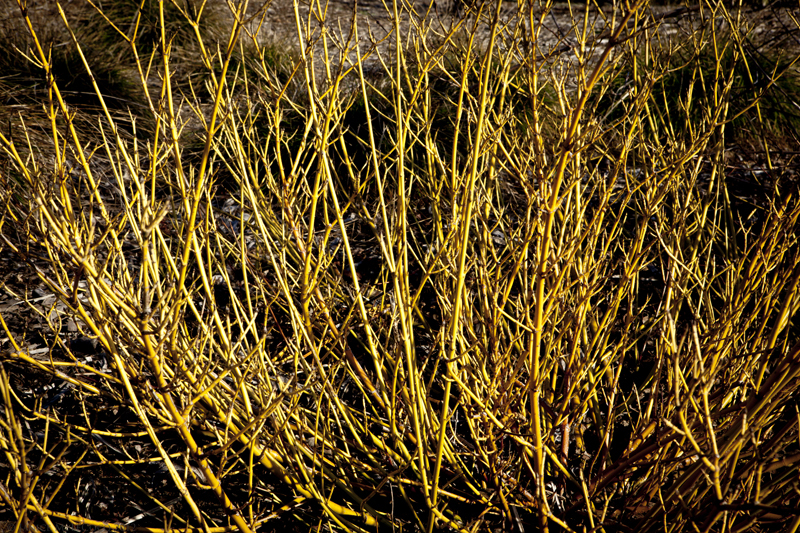 It grows in full sun to zone 6, and its yellow color is more pronounced in winter. There is no plant for brightening up a cloudy day like ‘Zebrina’, and she does it so gracefully. What if you don’t have the space for one of these behemoths? There are some lovely, smaller choices that can squeeze into almost any garden. 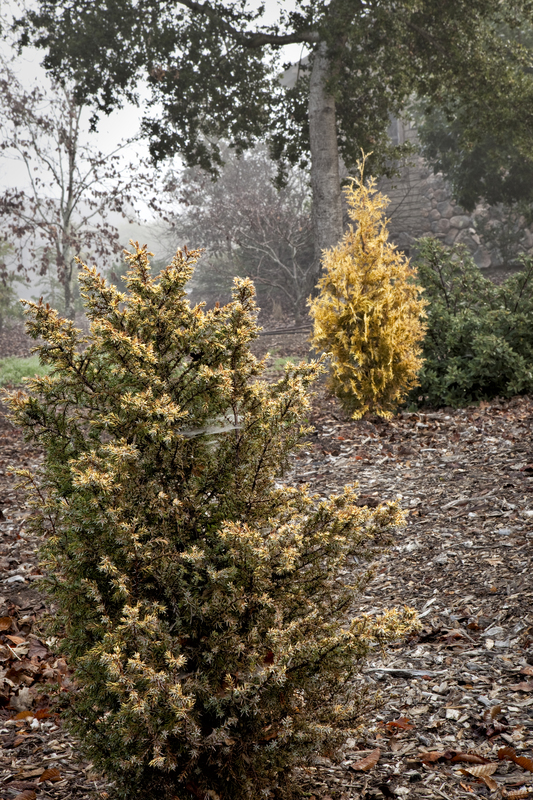 A golden variety of the American arborvitae, Thuja occidentalis ‘Malonyana Aurea’ is daintily columnar, generally not exceeding 10’ tall. 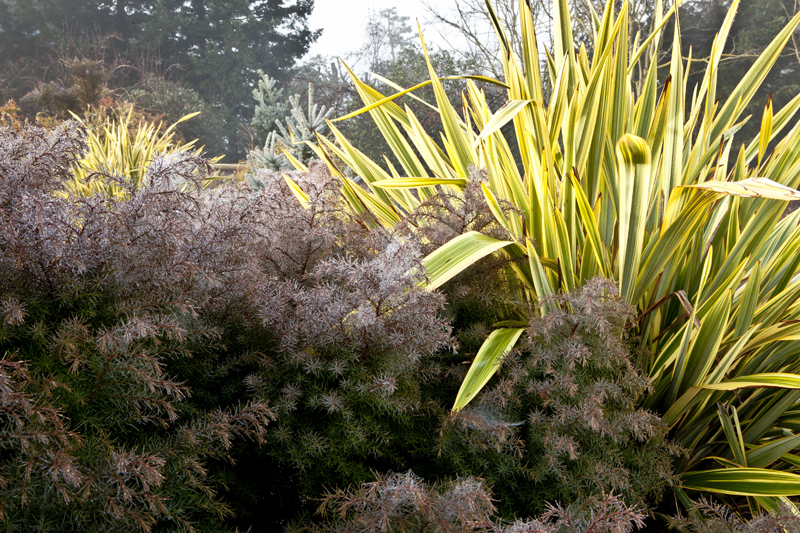 With such a slender growth habit, it fits nicely into a mixed border or bed. Don’t let its apparent daintiness fool you, however; ‘Malonyana Aurea’ can withstand the tough winters of zone 3, yet also grows happily in zone 9. Another toughie (zone 4) is ‘Lemon Thread’ Japanese false cypress (Chamaecyparis pisifera filifera ‘Lemon Thread’), which has a graceful, upright habit with softly arching branches. Lemon yellow rather than brilliant gold, it provides a softer glow than some of the other choices. Very slow growing to 3-5’ tall and wide. 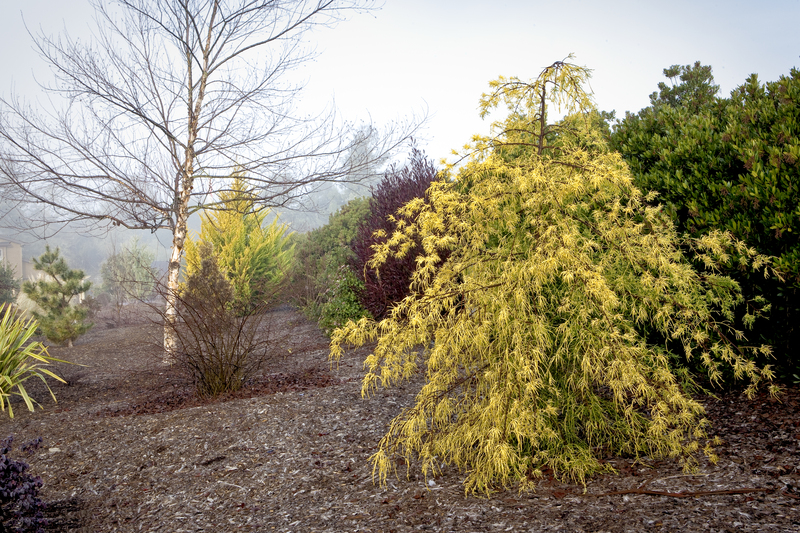 Chamaecyparis pisifera ‘Golden Mops’ is a close relation that has golden-yellow mop-like stems and a weeping habit and is another slow grower, maturing at about 5’ tall and a bit wider. This variety will hold its golden color through the summer if it gets full sun, although then you have to watch out for winter burn if you’re in a cold zone (this one can grow as low as zone 4). Try planting it with some protection on the south side. 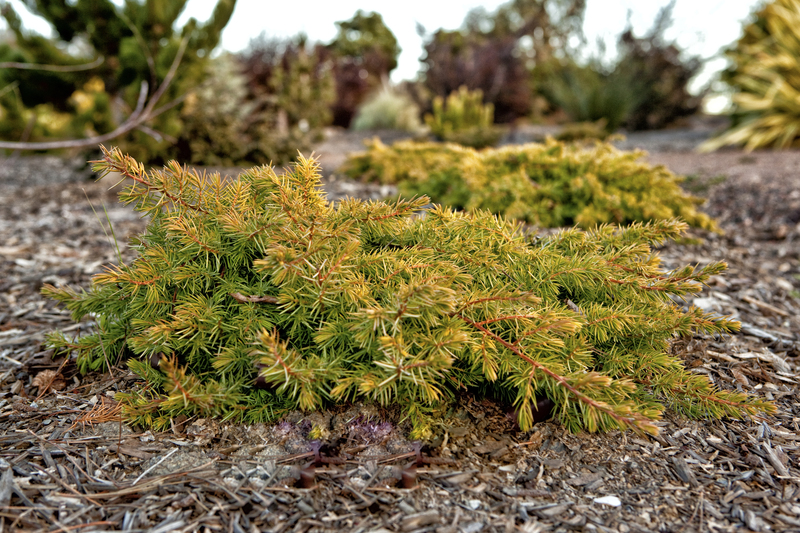 If you want a true dwarf, try Chamaecyparis obtusa ‘Kojolko hiba’, which stays under 2’ tall and has a spreading habit. Its lacy foliage is bright gold. 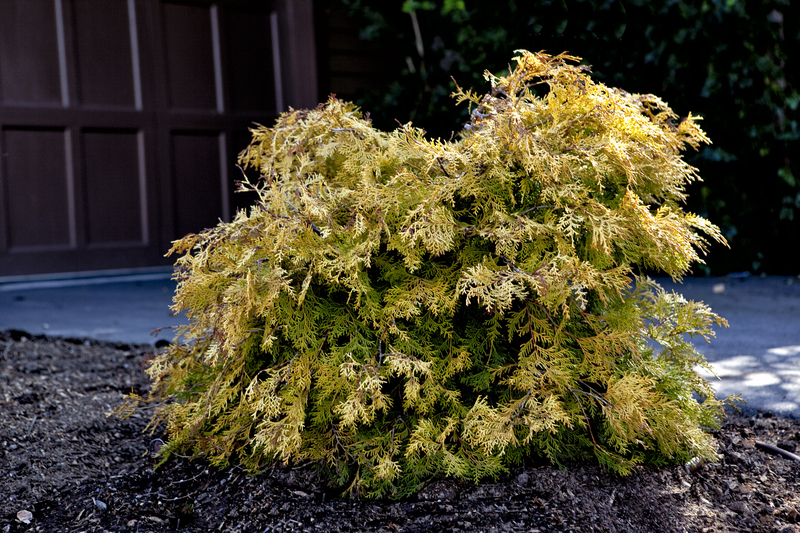 We find it does better here with a bit of shade, and holds its color in the shade, (unlike C. obtusa ‘Gold Fern’ which is lovely but very green in shade. Chamaecyparis obtusa ‘Mariesii’ is also a dwarf, and grows in either sun or light shade. More sun brings out more gold; if grown in shade it has white frosting. ‘Mariesii’ is spreading when young but will become more upright. You can trim the leader to keep its shape lower. 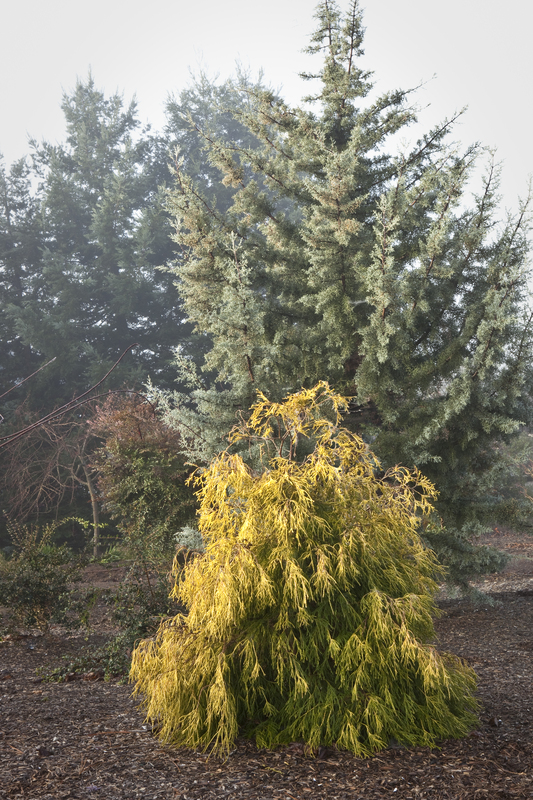 The most asked-about plant in the garden has to be the Chamaecyparis lawsoniana ‘Golden King’, a bicolor specimen whose dark bluish green foliage is frosted with deep, bold yellow. While this plant can get quite large eventually, that isn’t likely to trouble anyone who plants it, as it is extremely slow growing. It can also be pruned gently. And finally, how could we not mention at least one ground cover conifer? 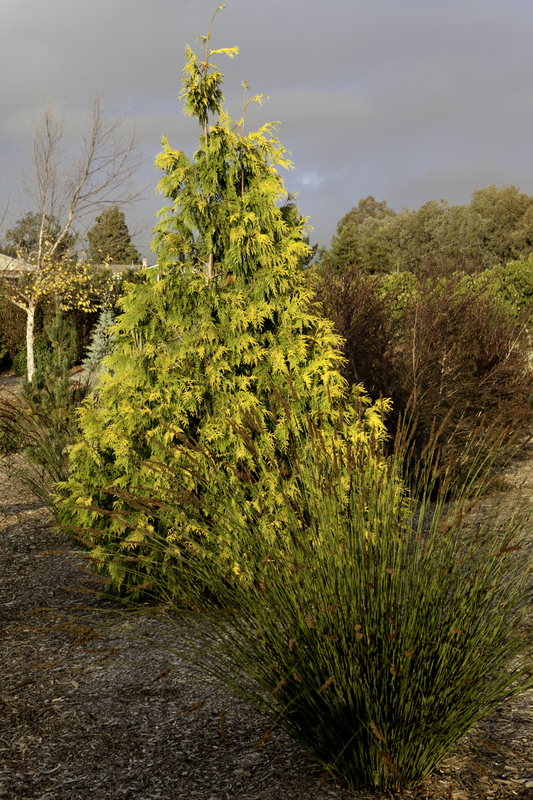 While we have and love Juniperus ‘Golden Wiltonii’, it just doesn’t pack the punch of J. conferta ‘All Gold’, which glows across the garden with a chartreuse-gold intensity that is hard to beat. Can take full sun and extreme heat (supposedly over 100°F with no problems) and makes a great skirt for deep green foliage. 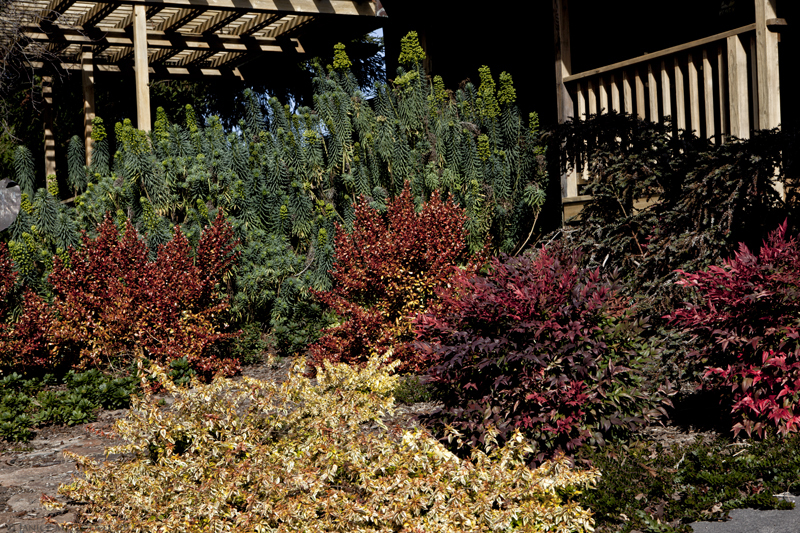 We invite anyone with a favorite golden evergreen conifer that we didn’t mention to nominate a favorite. 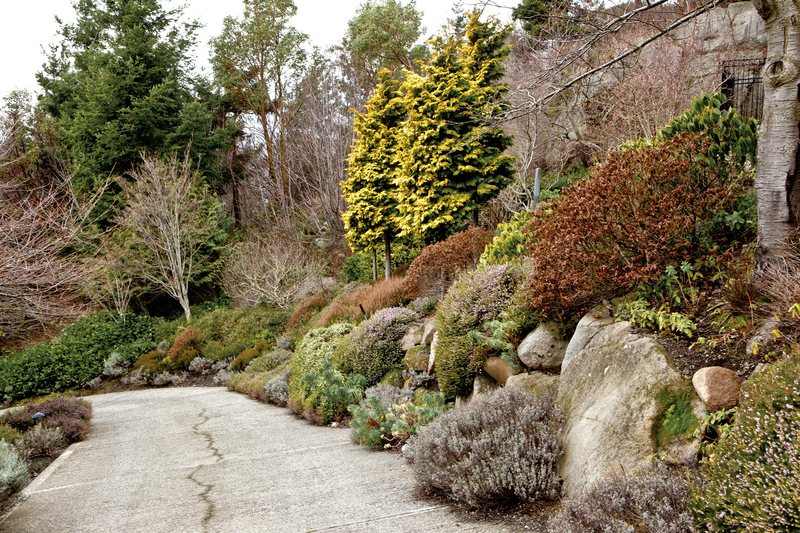 And, there are wonderful golden evergreen plants that are not conifers. Stay tuned for Part II, coming soon! Categories: Circle Oak Gardens, Design philosophy, Gold, Winter | Tags: evergreen shrub, thuja plicata, woody shrubs | Permalink.